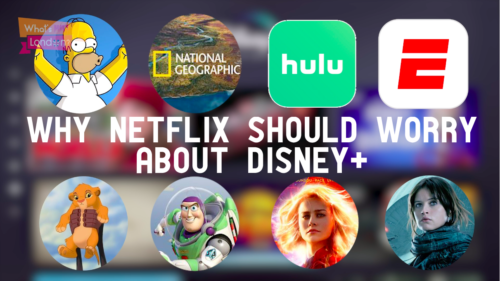 Why Netflix Should Be Worried About Disney+ | What's Hot London? The ‘streaming wars’ took another turn yesterday as Disney finally revealed it’s new streaming platform after 2 years of speculation. Here’s why Netflix should be worried. The platform, called Disney+ will launch in the US from November 12th (UK launch TBA) with a starting price of just $6.99 which is far cheaper than Netflix. Then there is the content itself, on which, Disney seems to have gone all out. We all know that Netflix’s movie selection is somewhat lacklustre and this something Disney+ will be certain to capitalise on with its huge roster of films. Being able to see the entire Disney, Pixar, Marvel and Star Wars library all in one place will be a game changer. Disney will also produce original shows and films including multiple Marvel series and the Star Wars spin-off ‘The Mandalorian’ which is rumoured to cost $100m on its own. However, these are of less importance than the programming which already exists. Add to that the new content which Disney has procured through its $70bn takeover of 20th Century Fox and the lineup looks mouthwatering. With all 30 series of the Simpsons, National Geographic and a possible bundle with Hulu and ESPN added into the mix, Disney+ has a really diverse platform with plenty of popular content at a lower price than its main competitor. For Netflix that is a lot to worry about, however there are a few comforts. Disney will have to wait for up to 4 years to assemble its full roster of content. This is because of existing deals to sell programming to other platforms made before Disney had streaming ambitions of its own. Furthermore, Disney+ is going to be a family orientated platform. That means nothing R-rated and a focus on existing content over originals, leaving room for Netflix and others to continue ploughing money into their original content uncontested. The real question for Disney+ is in its name. Will customers be willing to add another streaming service to what they already pay for? Or will Disney+ have to replace everything else, survive.